Georg Michaelis (8 September 1857 – 24 July 1936) was Chancellor of Germany for a few months in 1917. He was the first non-Junckers to hold the office. With an economic background in business Michaelis main achievement was to encourage the ruling-classes to open peace talks with Russia. Contemplating the end of the war was near he encouraged infrastructure development to facilitate recovery at war's end through the media of Mitteleuropa. A somewhat humourless character, known for process engineering, Michaelis was faced with insurmountable problems of logistics and supply in his brief period as Chancellor. Michaelis, born in Haynau in the Prussian Province of Silesia, grew up in Frankfurt (Oder). He studied jurisprudence at the University of Breslau, the University of Leipzig and the University of Würzburg from 1876 to 1884, becoming a Doctor of Laws. From 1885 to 1889 he lived and worked in Tokyo in Japan as a law professor of the Law School of the Society for German Sciences. After his return to Germany he became a member of the Prussian administration. In 1909 he won appointment as undersecretary of state to the Prussian Treasury in Berlin. 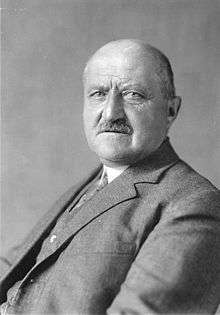 From 1915 onwards he headed the Reichsgetreidestelle, an office responsible for the administration of Prussian corn and wheat in World War I. After the Reichstag and the High Command (OHL) forced the resignation of Theobald von Bethmann Hollweg on 10 or 13 July 1917, Michaelis emerged as the best candidate for both Chancellor of Germany and Minister President of Prussia. Hindenburg agreed because Michaelis was the army's man. He had visited the OHL on several occasions in his position as Undersecretary of State in the Prussian Ministry of Finance and Commissioner of Food Supplies. As an unknown to both parliament and the Kaiser he presented an oppositional figure to the Majority Parties in government. They knew not what to expect from this militarist. "I have deprived it of its most dangerous features by my interpretation of it. One can make any peace one likes with this resolution"
, he reassured the heir to the throne. But it was a feint, and Michaelis role in the discreditable episode was designed to facilitate a permanent closure of the Reichstag. The army perceived the Majority Parties as posing a threat to stability in Germany in the wake of the Bolshevik Revolution had brought an end to the Russian war effort. But this had left him very "uncertain" as to the place of the Central Powers. Knowing Austro-Hungary was bankrupted by the fighting, he understood their demand to sue for peace; but the military was unwilling to relinquish any power to the civilian authorities. The OHL hoped to destabilize the Ukraine and Baltic States so as to bring Russia ailing Tsarist regime to the negotiations, while guaranteeing Germanic frontiers, in more than Michaelis' status quo ante bellum. But Michaelis was a pragmatist and a realist; whatever the Kaiser might have believed about military victory. The Chancellor chaired the Second Kreuznach Conference discussing the fate of Alsace-Lorraine on August 14, 1917. The proposal included one for an integrated Federal State coupled to socio-economic changes connecting the Prussian-Hessian railways across Germany. Alsace's connectivity was an extension of a war aims policy via Aachen into the Belgian occupied zones and across neutral Netherlands, as had already been achieved in Luxembourg. Longwiy was the centre of German Steel Association's industry. Located on the border of Belgium and Lorraine, it was at the contractual nexus of the Low Countries adjacent to the Dutch treaty town of Maastricht. Germany's producers like Thyssen and Krupp wanted a guaranteed supply of coal from France and return to an answer to the Belgian Question, which monopolised the thinkers on the Western Front. On 29 August it was in light of the Longwy-Briey Plan meeting in a railway carriage near Aachen that he was given "an impossible task" of perpetuating the war for "another ten years". But the economic plan Mitteleuropa depended on the Quadruple Alliance which was in trouble. The brains behind the second conference was the new Secretary of State, Max von Kuhlmann, with Czernin (Russia) and Hohenlohe (Austria) chaired in chamber by Michaelis. But he underestimated Britain's economic determination to stay the course until the bitter end. The unenviable task to spell out the myth of a German victory fell to Michaelis, still obliged to the Kaiser and OHL in a report to the Conference. In the end the government won over the Reichstag with only one small party outstanding in its continual opposition to the plan. The Fatherland Party and the OHL now under Ludendorff demanded a rigorous pro-Kaiser pursuance of a Rumanian-Germany; Bessarabia was a rich, fertile cereal basin was ripe for the Central Powers to pick. Michaelis was sceptical of OHL's avowal of the closest relationship with Austria when another conference was called for 7 October. Still dominated by the obsession with seaports for the Reich, Michaelis demanded access in Dalmatia from the Austrians, as well as those on the Belgian coast. Through the vehicle of Mitteleuropa he sought to enable the Austrian economy to withstand the peace conditions he knew would be imposed on the German customs union. But the candidate chosen as the new Chancellor was the Army's and not the Reichstag perceived to be dominated by the centre-left. "We have lost a statesman and secured a functionary in his place", remarked Conrad Haussmann, a Social Democrat Member of Reichstag, Michaelis was perceived to be a mere bureaucrat, rather than an orator of standing. "Germany's first bourgeois chancellor" was the only non-titled person to serve as chief minister during the Hohenzollern monarchy's 400-year rule over Prussia and Germany. But the army 'dictatorship' of Paul von Hindenburg and Erich Ludendorff of the General Staff remained in control behind the scenes. In August, the naval mutinies at Wilhelmshaven led to executions. Michaelis blamed the socialists in the Reichstag hoping to split the coalition. But the Reichstag demanded his resignation. On 24 October 1917 the National Liberals three socialist parties in the coalition made representations to the Kaiser. In his autobiography he laid the blame on his own refusal to bend to pressure for liberal electoral reforms. The deputies hoped to replace him with a Zentrum aristocrat, Georg von Hertling. He remained in this position until 1 November 1917, when he was forced to resign after coming under fire for refusing to commit himself by endorsing a resolution passed by the Reichstag favouring peace without annexation or indemnities. Michaelis attempted to retain his role as Prussian Minister President, but without success as Count Hertling was determined that the two posts could not be separated. From 1 April 1918 to 31 March 1919 he served as Oberpräsident of the Prussian province of Pomerania. After the end of World War I, he cooperated with the local workers' and soldiers' council. Nevertheless, the socialist-dominated government of Prussia soon replaced him. Michaelis worked in the fields of economic lobbying, in student organizations, in the synod of the Evangelical Church of the old-Prussian Union and became a member of the monarchist/national conservative German National People's Party (DNVP). In 1921, he published his memoirs, Für Staat und Volk. Eine Lebensgeschichte. Georg Michaelis died on 24 July 1936 in Bad Saarow-Pieskow (Brandenburg) at the age of 78. 1 2 3 4 Chisholm 1922. ↑ Strachan, Hew, "The First World War" (London 2003), p.263, 264, 266-67. ↑ Hanssen, "Diary of a Dying Empire", p.231. ↑ Daniel Hord (ed. ), "The Private War of Seaman Stumpf" (London 1969), p.345; Strachan, p.266. ↑ M. Kitchen, The Silent Dictatorship, pp.170-1. Chisholm, Hugh, ed. (1922). "Michaelis, Georg". Encyclopædia Britannica (12th ed.). London & New York. Becker, Bert (2001). Georg Michaelis: Ein preußischer Jurist im Japan der Meiji-Zeit; Briefe, Tagebuchnotizen, Dokumente 1885-1889 (in German). München: Iudicium. von Braun, Magnus Freiherr (1955). Von Ostpreussen bis Texas (in German). Holkamm. Fischer, Fritz (1967). Germany's Aims in the First World War. New York. Kitchen, Martin (1976). The Silent Dictatorship: The Politics of the High Command under Hindenburg and Ludendorff 1916-1918. London. Michaelis, Georg (1922). Fur Staat und Volk (in German). Berlin. Regulski, Christoph (2003). Die Reichskanzlerschaft von Georg Michaelis 1917: Deutschlands Entwicklung zur parlamentarisch-demokratischen Monarchie im Ersten Weltkrieg (in German). Marburg: Tectum-Verlag. Snell, John L. (July 1951). "Benedict XV, Wilson, Michaelis and German socialism". Catholic Historical Review. Strachan, Hew (2003). First World War. London.